Garage doors are large mechanisms that can cause injury or property damage when they are mishandled or when they suffer from a problem. A regular maintenance service is something you may want to consider, as it can greatly increase the lifespan of your system and allow you to avoid a lot of potential issues. But if you decide to not opt for this, or even if you do, making some time to regularly inspect your door and all of its components is highly advisable. As a responsible homeowner, it is your duty to make sure that your overhead door is in good condition at all times. You have to be conscious of irregular noise and malfunctions. For instance, if you know that your garage door springs are old and are most likely reaching the end of their lifespan, check their condition more often. Do not wait for one of these dangerous components to break and possibly injure you or one of your family members. In fact, checking every working part of your system won't take long, but it will be very beneficial. 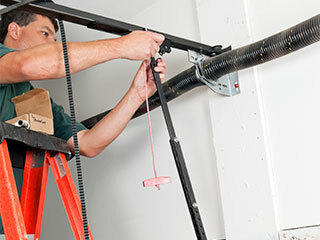 If you notice that the cables are worn or getting frayed, they may also break and therefore should be replaced. While you make consider yourself an expert handyman who can undertake every type of repair or replacement problem, but when it comes to your garage door, you'll want to play the humble part of the concerned homeowner. Never attempt to replace any part of your system by yourself. The components involved in your door's operation are under extreme tension and can be extremely dangerous if they aren't handled by professionals with the right tools and the necessary experience and skill. To put it simply, it's just not worth the risk. The opener is both the engine that drives your door's operation and its "brain", as it is also in control of its movement. Openers manufactured after 1993 are required by law to have a built-in reversal system. This usually manifests in two ways. The first is a pair of safety sensors that are attached to each side of the threshold of your garage. When there is an object or a person blocking your door's path, these photo-electric "eyes" are supposed to detect the obstacle and prevent the door from closing down on it. The second method is the force sensitivity. That one is in charge of reversing your garage door when it senses resistance. If your door starts closing and something is blocking its path, it should open back up the moment it touches the object. You can test both of these methods, and if your door fails to perform as expected, you need to call us right away. Using a garage door with a compromised safety feature is extremely dangerous. Contact our team at Garage Door Repair Las Vegas when you need the assistance of professional technicians.